or view a list of all scholarships. 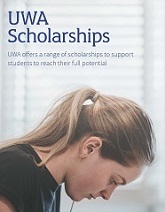 Scholarship information for people considering study or research at UWA. Scholarship information for students who are studying at UWA. Apply for funding opportunities for Bachelors, Honours and Masters Courses commencing next year. The ITTC to Transform Maintenance through the use of Data Science is seeking 6 students.